That’s what I ask myself on those rare occasions when I decide to take a bath. Baths aren’t the most practical for getting clean quick. Taking one requires us to slow down, to carve out time for ourselves. Even though many of us would say we reserve our evenings for relaxation, we’re still too occupied to consider spending twenty minutes soaking in the tub! For my part, after supper I often attempt to squeeze in just “one more thing” for work, or I’m tempted to do chores while the baby’s asleep, or I’m just too exhausted to take the time to set the stage for a nice bath. Lately, it’s been my goal to be more intentional about keeping work and play separate. Rather than fritter away my evenings, I want to fully relax…and taking a hot bath is a great way to do that! It’s also one of my favorite ways to induce sleep naturally. I used to sleep easily, but after having my baby son I’ve gotten into the habit of waking often at night, even though he’s six months old now and he’s no longer waking! Ready for your own relaxing, detox bath experience? Stir 1 1/2 Tablespoons sweet almond oil (or your favorite nourishing carrier oil) into 1 1/2 cups Epsom salts. Add 10 drops of peppermint essential oil and mix well. Store in a pint-sized mason jar. 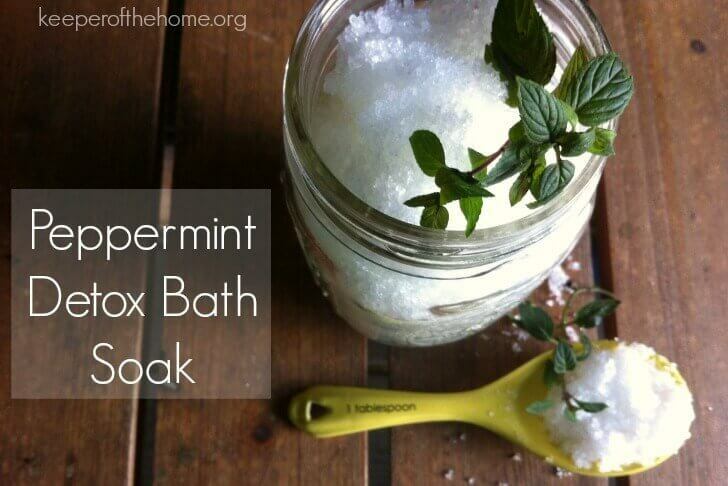 Note: Peppermint essential oil has many benefits, but it’s a good pick for a detox bath because it promotes perspiration to help you sweat out toxins. However, I’ve read that for some nursing mothers, it can interfere with milk supply. While I’m nursing, I will probably stick to frankincense or another oil that’s safe for breastfeeding. 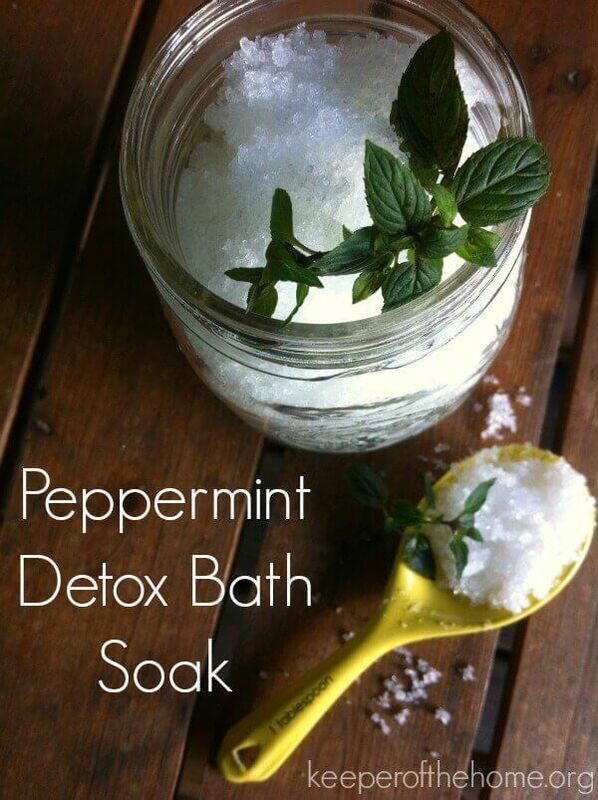 Add 1 1/2 cups bath salts. Create your ambiance: put on some classical music or Andrea Bocelli, light a few candles, prepare a cup of herbal tea (or spiced vanilla milk, if you really want to sleep well later on!). 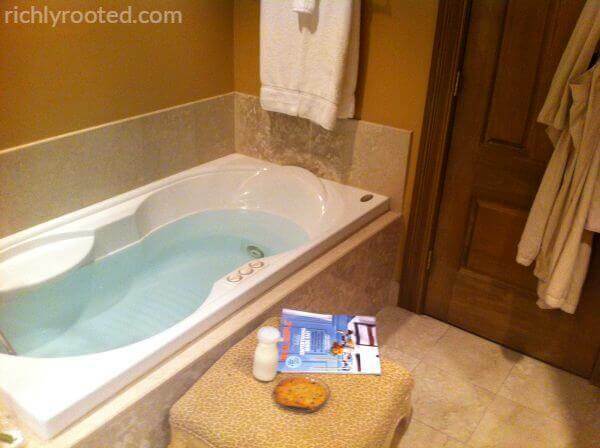 Set out a towel and lotion to be ready when you emerge from the bath. Don’t wait to enjoy a good soak in the tub! That’s another thing I’ve learned: don’t wait. You can fill your life with simple abundance, even on ordinary Mondays, if you’re willing to take just twenty minutes. Do you take baths? What are your favorite essential oils to add to the bath? This recipe from Elsie looks AMAZING! Just what I needed today. I see a good long detox bath in my future…..
Like what I’ve seen on here. Absolutely gonna try the detox bath!